Nikko's Shinkyo (sacred bridge) is part of the reason for its status as a World Heritage Site. 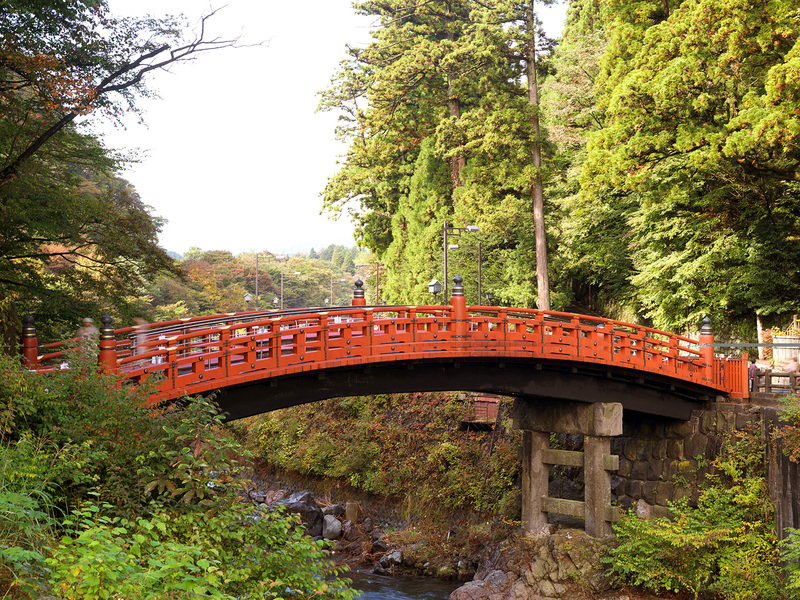 The red lacquer bridge crosses the Daiya River, and literally bridges the town of Nikko and the sacred temples. It is the oldest drawbridge in Japan, and considered by the Japanese as the most beautiful. And sacred. The origins of the bridge are shrouded in mystery, but in its present form, it is said to have been built in 1636. Spanning some 28m long, it sits 10.6m above the water. Legend has it that the priest Shoto was to climb Mount Nantai to pray for national prosperity. In 766, they arrived at the riverside of Daiya, but could not cross the river because of the ferocious water flow. He prayed, and a god appeared and relased his two snakes, one red and the other blue...which transformed themselves into a rainbow bridge. The Priest and his party were able to cross the river. And when they had crossed the bridge, the he looked back, and the bridge was gone!